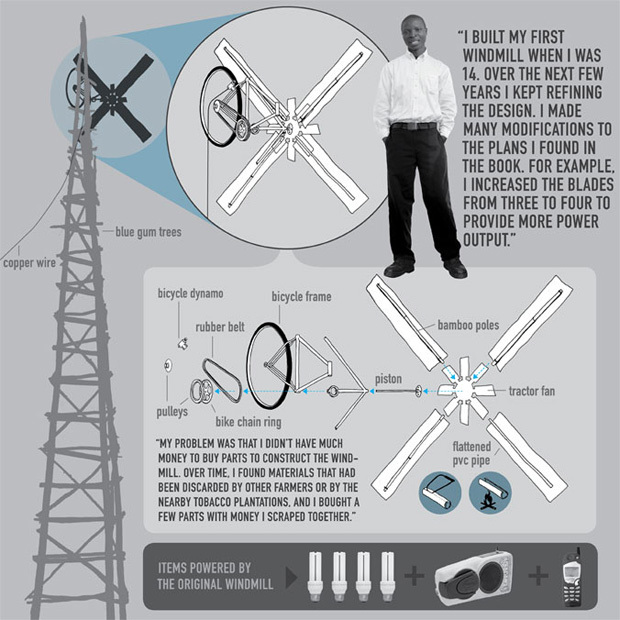 A 14 years old Malawian inventor William Kamkwamba built an electricity-generating windmill from spare parts, working from rough plans he found in a library book “Using Energy.” He used a bicycle frame, a pulley, and a plastic pipe. Generating 12 watts of electricity – enough to power four light bulbs and two radios for his family. His next aspiration was to build another one producing more than 20 watts – to pump water and prove irrigation for the village crops. 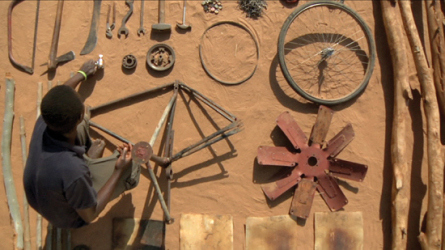 He started the Moving Windmills Project to support “Malawian-run rural economic development and education projects in Malawi, with the goals of community economic independence and self-sustainability; food, water and health security; and educational success.” You can learn more about the current initiatives and donate to support the project.